Vedantu.com - No.1 online tutoring company in India provides you Free PDF download of NCERT Solutions for Class 12 Chemistry Chapter 3 - Electrochemistry solved by Expert Teachers as per NCERT (CBSE) Book guidelines. 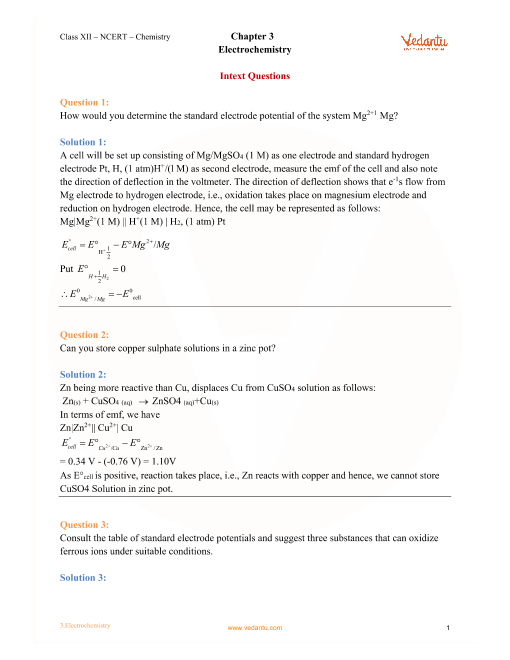 All Chapter 3 - Electrochemistry Exercise Questions with Solutions to help you to revise complete Syllabus and Score More marks. Register for online coaching for IIT JEE (Mains & Advanced), NEET, Engineering and Medical entrance exams. Study of electrochemistry is important for creating new technologies that are eco-friendly. The transmission of sensory signals through cells to brain and vice versa and communication between the cells are known to have electrochemical origin. Electrochemistry, is therefore, a very vast and interdisciplinary subject. In NCERT Grade 12 Chemistry Chapter 3, Electrochemistry; only some of its important elementary aspects of the topic are covered. After studying this chapter, students will be able to describe an electrochemical cell and differentiate between galvanic and electrolytic cells; apply Nernst equation for calculating the emf of galvanic cell and define the standard potential of the cell; derive relation between standard potential of the cell, Gibbs energy of cell reaction and its equilibrium constant; define resistivity (ρ), conductivity (κ) and molar conductivity ( Ʌm) of ionic solutions; differentiate between ionic (electrolytic) and electronic conductivity; describe the method for measurement of conductivity of electrolytic solutions and calculation of their molar conductivity; justify the variation of conductivity and molar conductivity of solutions with change in their concentration and define Λom (molar conductivity at zero concentration or infinite dilution); enunciate Kohlrausch law and learn its applications; understand quantitative aspects of electrolysis; describe the construction of some primary and secondary batteries and fuel cells and explain corrosion as an electrochemical process. Electrochemical Cells, Galvanic Cells, Measurement of Electrode Potential, Nernst Equation, Equilibrium Constant from Nernst Equation, Electrochemical Cell and Gibbs Energy of the Reaction, Conductance of Electrolytic Solutions, Measurement of the Conductivity of Ionic Solutions, Variation of Conductivity and Molar Conductivity with Concentration, Electrolytic Cells and Electrolysis, Products of Electrolysis, Batteries, Primary Batteries, Secondary Batteries, Fuel Cells and Corrosion are the topics discussed in this chapter. NCERT Grade 12 Chapter 3, Electrochemistry holds a total weightage of 5 marks in the final examination. Get 100 percent accurate NCERT Solutions for Class 12 Chemistry Chapter 3 (Electrochemistry) solved by expert Chemistry teachers. We provide solutions for questions given in Class 12 Chemistry text-book as per CBSE Board guidelines from the latest NCERT book for Class 12 Chemistry. The topics and sub-topics in Chapter 3 Electrochemistry are given below. Chapter 3 Exercises - 18 Questions with Solutions. Other than given exercises, you should also practice all the solved examples given in the book to clear your concepts on Electrochemistry. Download the free PDF of Chapter 3 Electrochemistry and take the print out to keep it handy for your exam preparation.